Some years ago when our children were pre-teens, we decided to decorate a totally natural Christmas tree. The fragrant fir was decorated with homemade ornaments by both our children as well as old decorations my husband and I made as children. We made popcorn and cranberry strings and spray painted pine cones. 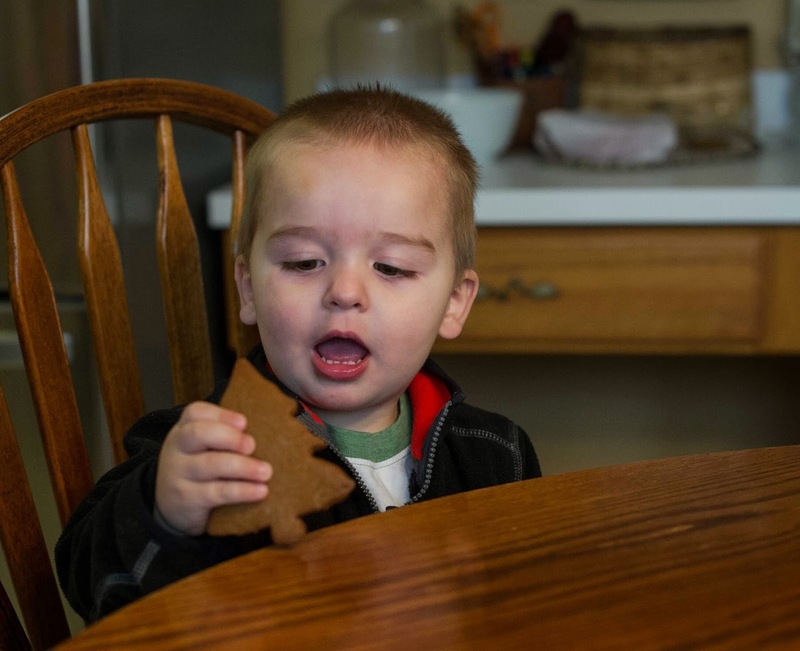 The crowning touch was homemade gingerbread men decorated by our little family. I loved that tree and was so proud! I was amazed how beautiful it was even without sparkly glass ornaments, at least for a day or two. One morning I woke to see some of the gingerbread men were missing legs, and lower bodies, and some were completely gone, all except for the small ribbon used to hang the cookies on the tree. Was it the kids? Why would they eat the ornaments? There are plenty of cookies around the house! Then I saw the look of disgrace and shame on our two Labrador fur children. Nose level cookies proved too much of a temptation for those pups. That explained the gingerbread men bitten in half. Needless to say the surviving gingerbread men were relocated to higher branches with hopes they would survive until Christmas. I often think about that tree and hope when my grandson (and future grandchildren) are older, we can decorate another with handmade goodies. It’s been a long time since I’ve made gingerbread cookies. But now I remember why they are a beloved classic. 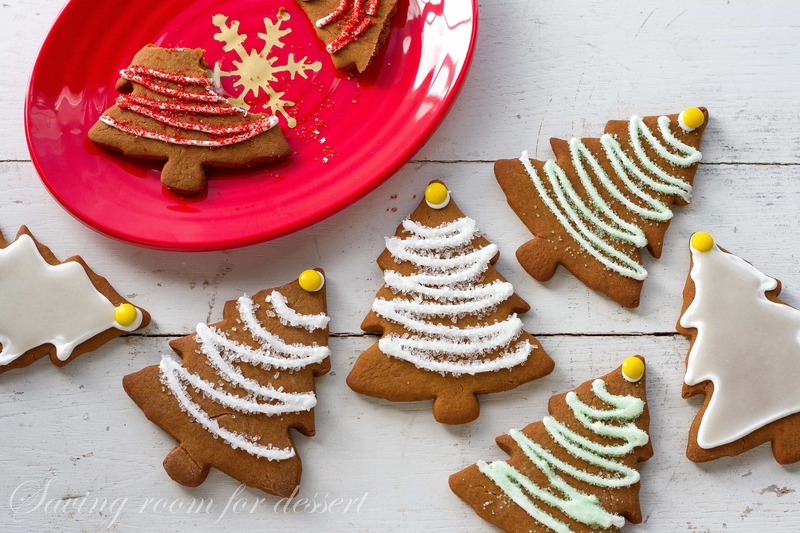 I adore the distinct ginger and molasses flavor and they are such fun to decorate! I can’t wait until my grandson is old enough to help with the sprinkles and cookie cutters. Gingerbread cookies that are iced will soften a bit which makes them easier to eat. If you want to hang the on your tree as decorations, they are best left plain. 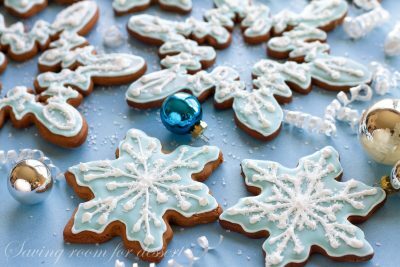 You can decorate the cookies using Royal Icing or a simple vanilla glaze. Candies such as these mini-M&M’s add a nice touch of color too. Beat the butter and sugar on medium until light and fluffy. In a large measuring cup combine the baking soda and 1/4 cup hot water. Stir until dissolved then add the molasses. In a medium mixing bowl combine the flour, ginger, cinnamon, salt and allspice. Add the flour mixture to the butter mixture alternately with the molasses mixture, beginning and ending with the flour. Shape the dough into a ball and cover and chill at least 1 hour or overnight. Preheat oven to 350 degrees. Roll the dough out to 1/4-inch thick on a lightly floured work surface. Cut dough into desired shapes. Place the cookies 2 inches apart on a parchment lined baking sheet. Bake at 350 degrees for 15 minutes. Allow the cookies to cool on the baking sheet for 2 minutes then transfer to a wire rack to cool. 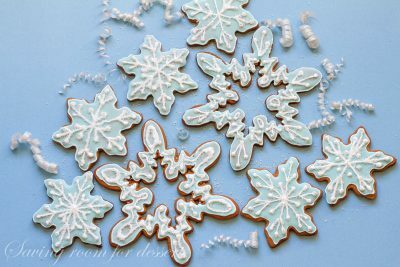 Spoon Royal Icing into a piping bag fit with a small tip and pipe icing onto the cooled cookies. Add candies, crystals or colored sugar as desired. 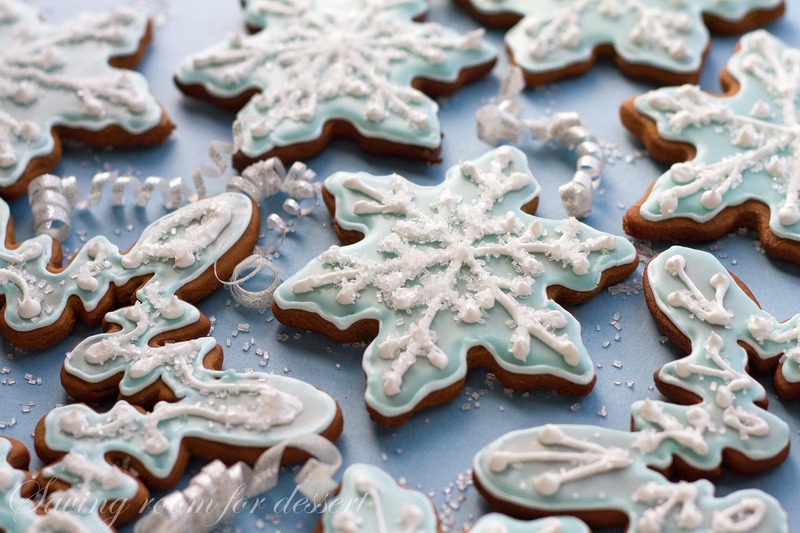 Allow the icing to dry completely. Store cookies in an airtight container. Beat the sugar, water and Meringue Powder together until stiff peaks form. Lightly glaze each cookie as desired. 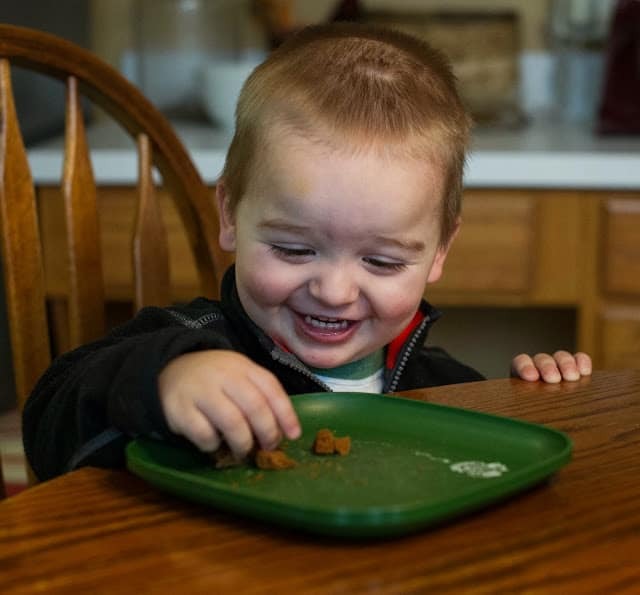 One of the best things about being a grandma is seeing your grandson do things for the first time. Walking, talking, trying new foods, it’s all so exciting! We are blessed to live close to our daughter and get to visit with them at least once a week. Issac is growing so fast! He’s sitting in a grown up chair at the table. 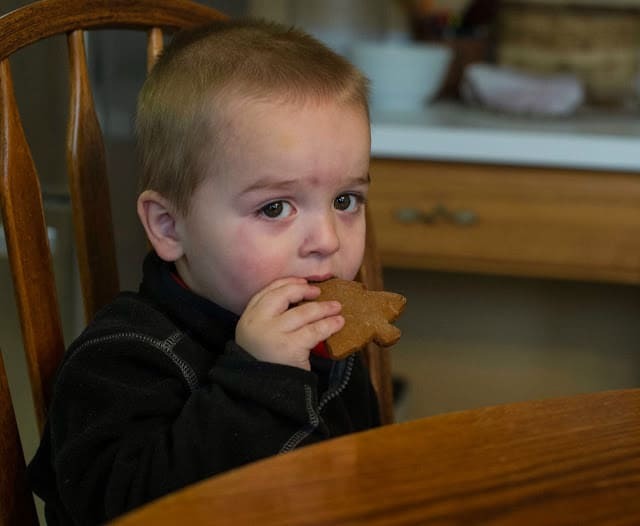 Gram gave him his first gingerbread cookie to try. It is a bit hard to bite, so maybe we can help. Little pieces work so much better and he liked it! Hope you’re ready for the holidays and all your recipes have turned out wonderful. We’re getting there and look forward to the time with family and friends and can’t wait to see what Santa brings our little cutie! PIN to your favorite cookie board on Pinterest! These cookies are so pretty! Happy holidays! Beautiful cookies! And so funny about the dogs–I'm surprised they left any cookie remnants at all! Issac has a very addictive smile! Makes me want to smile, too! How lucky you are! These are gorgeous cookies, Tricia. I hope you had help decorating them! Or at least a peaceful day while you did! Have a great holiday! 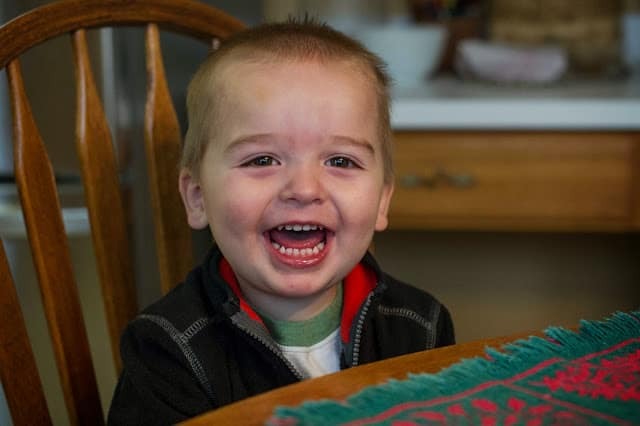 What a cutie your little grandson is! I've enjoyed being the grandma to our two little grandsons since my husband and I had two girls. They make baking even more fun these days :)<br /><br />What gorgeous decorated gingerbread! Just wanted to say thanks for the memories and to tell you what gorgeous pictures of the cookies you took. You have a wonderful talent and I'm thrilled to say I know you! Love you Bri! Can't wait to see you all soon. I'm bringing cookies and hope your wonderful sausage balls will be with you 🙂 Hug your cute husband for me! 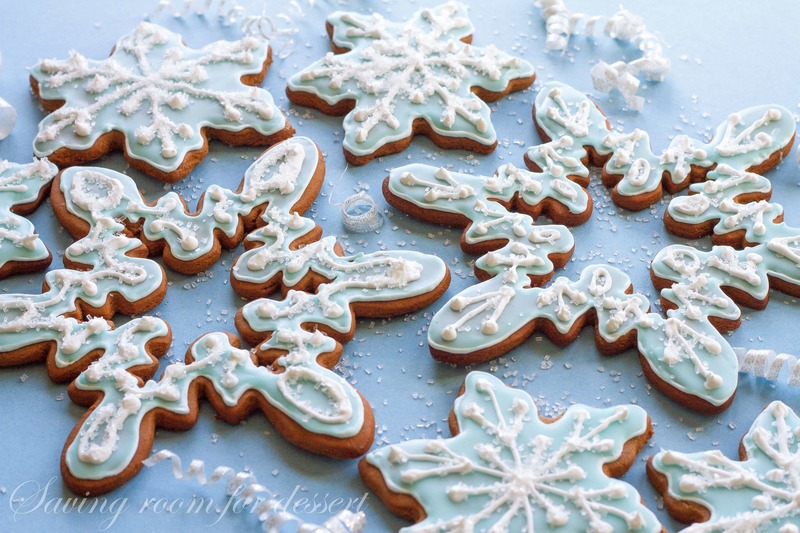 Those snowflakes are so gorgeous! You did an excellent icing those cookies, Tricia. Issac is a big boy now. Wow – these are gorgeous!!! The icing looks delicious! 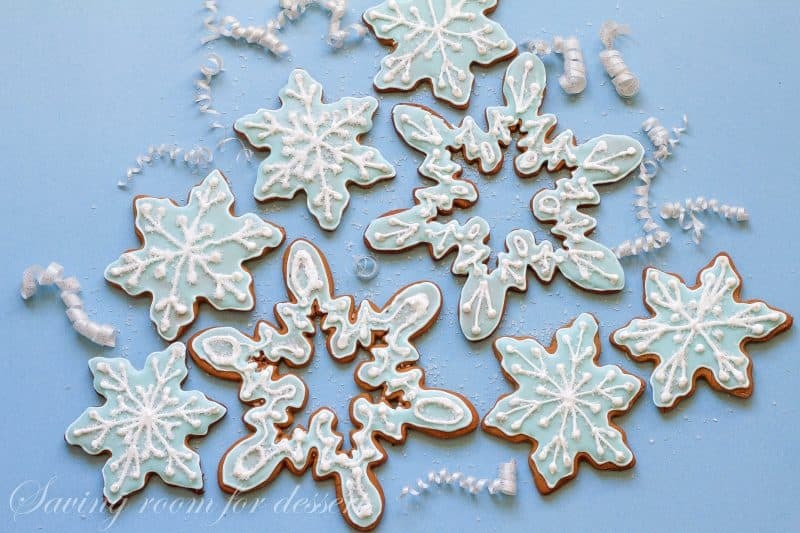 Wow these are so beautifully iced. I don't think I would have the patience or the skill for it but you did amazing! Your grandson is such a cutie! And obviously has good taste in cookies! They came out beautifully. <br />I had a sugar cookie-decorating party for my son and 4 of his cousins yesterday. I was amazed by how well they worked and how competent – I keep thinking of them as wobbling toddlers! It was a load of fun…you'll be decorating with your grandson in no time.